Dining Services Associate Shannon Keller, Employment Manager Kathy Kissinger (both from Country Meadows) and Community Outreach Coordinator Curtis Voelker from Central Penn at the company’s corporate headquarters in Hershey. 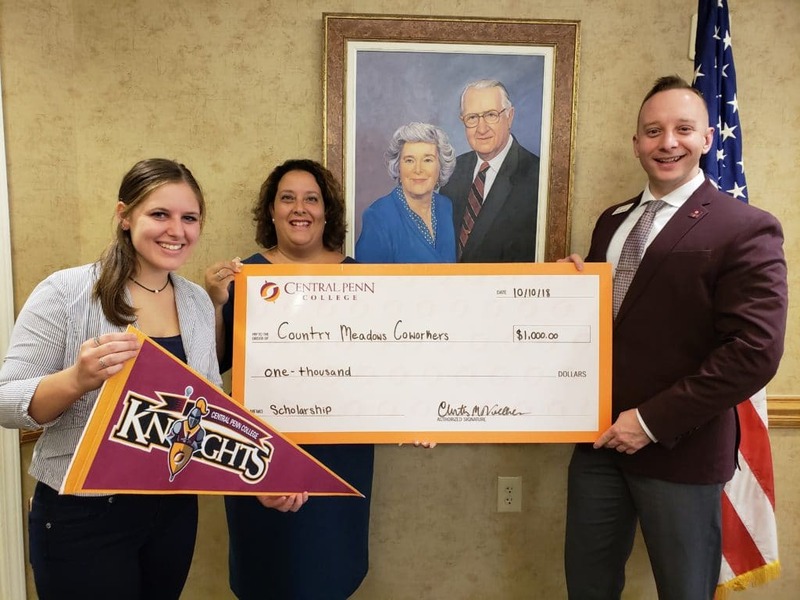 Country Meadows Retirement Communities employees are now eligible to receive a $1,000 scholarship from Central Penn College, thanks to a new Corporate/Community Partnership program. This new partnership applies to all employees at Country Meadows’ 11 retirement communities throughout Pennsylvania and Maryland. Central Penn College offers online, hybrid and on-ground classes at its Summerdale and Lancaster locations. Country Meadows has locations in Allentown, Bethlehem, Easton, Frederick (MD), Hershey, Lancaster, Mechanicsburg, Pittsburgh (South Hills), Wyomissing (Reading area) and two locations in York. Kissinger is a 1998 Central Penn graduate and Keller currently attends the college.